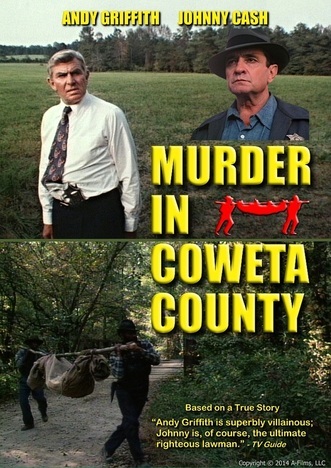 Murder in Coweta County is a well-acted, well-crafted period movie, with interesting twists. In 1948, rural Georgia, Coweta County is watched over by its legendary, indomitable Sheriff Lamar Potts (Johnny Cash). No felony had ever gone unsolved while Sheriff Potts was in charge. In the next county, though, there is a vast estate known as “The Kingdom.” It’s ruled by one man, John Wallace (Andy Griffith), whose power is absolute and beyond the law. But when Wallace chases one of his underlings to deliver ruthless punishment, he makes a critical mistake. He crosses over into Coweta County… Sheriff Potts’ territory. This is the compelling true story of the man who ran the Kingdom, and the man who brought him down.